In the previous pAsuram, AzhwAr mentioned about charama SlOka vaibhavam (glory of charama SlOkam). In this pAsuram, through an incident relating to vainathEya (garuda) as mentioned in mahAbhAratham, he says that sarvESvara (lord of all) will carry out the SaraNAgatha rakshaNam (protection of the surrendered) somehow or the other. mAdhali, the charioteer of indhra (head of celestial entities and the lord of three worlds bhU:, bhuva: and suva:) was looking for a suitable alliance for his daughter guNakESi. He went along with nAradha muni (son of brahmA) to many places looking for suitors and finally desiring to select a snake sumukha in pAthAla lOkam (nether world), asked sumukha’s grandfather Aryaka. Aryaka confided in mAdhali that garuda has already killed sumukha’s father and has vowed to kill and eat sumukha within one month. Undeterred by this, mAdhali went to indhra who was with upEndhra (emperumAn in the divine form of vAmana) and briefed him about this. upEndhra bhagavAn told indhra that sumukha could be given nectar (elixir). However, indhra, fearing the valour of garuda, granted sumukha long life, as a boon. Immediately, mAdhali gave his daughter in marriage to sumukha. On hearing this, garuda went to indhra who was with upEndhra and spoke ruthlessly to indhra for having assisted his prey, preventing him from having his prey. sumukha, in the form of snake, coiled himself around upEndhra’s seat [as an act of surrendering]. Looking at this, garuda told bhagavAn “despite my being your vehicle and your flag, is this the way you repay? Think whether I, who am bearing you, am more powerful or you”. emperumAn looking at garuda, said, “enough of your trumpeting. Don’t speak, ignorant of the fact that I bear you and all the worlds. See if you can bear my thumb alone” and pressed his thumb on garuda. Unable to bear the weight, garuda fell down. He then paid obeisance to emperumAn and asked for forgivance. emperumAn removed sumukha with his big toe, put him on garuda’s shouder and told him to protect him as his refuge. From then onwards, the two became good friends. This is the incident narrated in mahAbhAratham. This incident has been spoken of by poygai AzhwAr in mudhal thiruvandhAdhi 80 “aduththa kadum pagaigyarkku” and by thirumangai AzhwAr in periya thirumozhi 5-8-4 “nanju sEravdhOr”. Hasn’t sarvESvaran (lord of all) mercifully stated in SrI rAmAyaNam yudhdha kANdam 18-33 “abhayam sarva bhUthEbhyO dhadhAmi” (I give to one, who surrenders to me, protection from all). This pAsuram describes the way he gave refuge to sumukha who surrendered to him, from garuda who is principal among his followers. Since both are his followers, emperumAn followed a distinguished way in protecting one from the other. In case he had not given protection to sumukha, his words in SrI rAmAyaNam yudhdha kANdam 18-3 “mithrabhAvEna samprAptham na thyajEyam kathanchana I dhOshO yathyapi thasya syAth sathAmEthadhagarhitham II” (Even if a person comes in the garb of a friend, I will never forego him. If he has faults, it is very good. This is not something to be ridiculed by good persons) would have been proved false. Even though he has been decreed as prey for garuda, since sumukha was desirous of living, he had committed fault against garuda. If emperumAn had taken sumukha on himself and protected him, then his saying in varAha purANam “madh bhaktham Svapacham vApi nindhAm kurvanthi yE narA: I padhmakOti SathEnApi na kshamAi kadhAchana II” (even if my devotee is a lowly person who eats dog’s meat, if anyone commits an offence against him, I will not forgive him for hundreds of crores of kalpams (a lengthy period of time)) would have been proved false. Thus, without any falsehood occurring for either of these two sayings, emperumAn gave the responsibility of protecting sumukha to garuda himself. There could be a doubt as to whether garuda, a nithyasUri (permanent dweller of SrIvaikuNtam), would kill and eat snakes and whether he would argue with emperumAn. 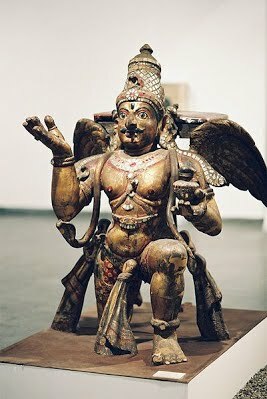 When emperumAn took the incarnation of upEndhra as the son of athithi and kasyapa, and as the younger brother of indhra, garuda too incarnated as son of vinathA, as a bird, and stood as the vehicle for emperumAn. Since he incarnated as a bird, in line with that nature, killing and eating snakes is justified for him. Arguing with emperumAn and being shown his place was intended to tell the world as to what happens when one carries out bhagavathapachAram (misdeed against emperumAn) and to manifest emperumAn’s greatness. padhi pagaigyarkku ARRAdhu – fearful of periya thiruvadi (garuda) , who has been enemy from the beginning. pAy thiRai niRp pAzhi – the divine bed which is like ocean having water with expansive waves. padhippagaigyarkku – the word pathin refers to lineage; hence this word refers to the enmity (between garuda and sumukha) for generations together. In other words, an enemy for the clan. Just as it is mentioned in thiruchchandha viruththam “puLLin meyppagai” (the real enemy of birds), is it not the natural enmity which exists between snake and garuda? pAythirai nIrppAzhi – the divine mattress which is like the ocean containing water with expansive waves. Since in mahAbhAratham it is mentioned that sumukha coiled around emperumAn’s cot, it is assumed as the mattress. Alternatively, since this incident could have happened after kalpam, it could be construed that this narrative had taken place in thiruppARkadal. madhiththadaindha – ascertaining and attaining emperumAn who would protect the person who has surrendered just then, leaving aside even nithyasUris such as garuda, AdhiSEsha et al, just like a cow would protect the calf that it has given birth to on that day, and would drive away the calf which it had given birth to in the previous year with its horn and hoofs. vAL aravam thannai – sumukha, the resplendent snake. Even in its state of being fearful of garuda, it was emitting radiance. It was having the radiance since it was confident after seeing emperumAn’s auspicious qualities of sauseelyam, saulabhyam (simplicity, easy to approach) etc, even before emperumAn approved of it, thinking “my task will fructify”. Did not vAlmIki say that vibhIshaNa looked radiant after ascertaining that SrI rAma will never reject him, as mentioned in SrI rAmAyaNam yudhdha kANdam 16-17 “antharikshagatha: SrImAn” (vibhIshaNAzhwAn who set out in the sky and was resplendent)? avan vallAgaththu ERRiya – making garuda to joyously don the snake sumukha like a garland on his powerful shouders so that sumukha could live without fear of anyone. mAmEni – emperumAn’s divine form overflowed with joy since the activity for his follower was completed successfully. This was similar to how SrI rAma had felt on coronating vibhIshaNa prior to waging war with rAvaNa, as mentioned in SrI rAmAyaNa yudhdha kANdam “abhishichya cha lankAyAm rAkshasEndhram vibhIshaNam I kruthakruthyas thadhA rAmO vijvara: pramOdha ha II” (SrI rAma, on completing the coronation of vibhIshaNa as the king of demons in lankA, felt relieved of his fever, and was joyous that his task has been completed). allAdhu onRu EththAdhu en nA – my tongue will not praise anyone other than emperumAn; it will not praise minor deities like rudhra who ran away, leaving his follower stranded , as in bANAsura war. Since AzhwAr does not consider other deities as important at all, he calls them as onRu [one, someone etc]. We will go on to the 75th pAsuram next. This entry was posted in iyaRpA, nAnmugan thiruvandhAdhi, Other on September 2, 2018 by T N Krishnan.